Sea Glass Jewelry by Jane > Who Is Sea Glass Jewelry by Jane? 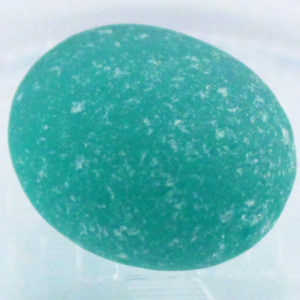 > What is Sea Glass? What is Beach Glass? Sea glass is an alluring, mystical medium, a topic of fascination and passion for a growing “sea glass army” in which I enlisted many years ago. Sea glass is broken glass that’s been discarded into an ocean or lake where it is transformed by the tumbling, churning powers of those bodies of water as it breaks into smaller pieces, floats to and fro with rocks, sands and waves until it is converted into a beautiful, flawless, sea glass gem with no rough edges remaining. The process can take from 30-50 and even up to 100 years or more, depending on ocean currents and tidal conditions. One day the finished glass is tossed by the waves and tides up onto the beach where it remains until it is discovered by a keen eyed sea glass enthusiast, perhaps wedged into the rocks or just lying on top of the sand. Over the last 20 years, sea glass hunting has become extraordinarily popular. Scores of books on the subject have been published. A plethora of sea glass groups have popped up on social media sites, where buyers and sellers from the world over bid on collections of sea glass from Italy, Greece, Iceland, Scotland, Japan, Australia and well beyond. 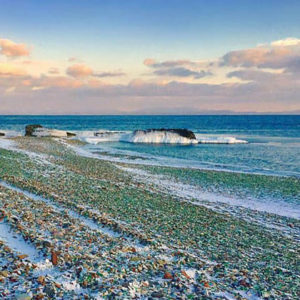 The recent news that a new sea glass beach has been discovered in Siberia has caused an uproar in the sea glass army as many enthusiasts book their tickets to Russia! This year there are sixteen Sea Glass and Ocean Arts Festivals planned in the U.S, which could draw over 100,000 people eager to learn more about sea glass and purchase items made with the miraculous material that was once a piece of Depression era glass, old mineral water bottle or a Vicks Vapo Rub jar. Sea glass is now used to create fashionable necklaces, earrings, bracelets and mosaic-type art. It is trendy, in demand and its supply is diminishing. Sea glass is a valuable commodity, especially if it is genuine and beach found. Rare sea glass colors, including turquoise, orange or red have even more value than the more common colors of greens, whites and browns. Real sea glass has a history with a story behind it that appeals to those who are looking for meaning and relevance in world where so much is mass produced. To learn more, read Where Does Sea Glass Come From? Sea Glass vs Beach Glass, Is There A Difference? We thought you’d be interested to know if there is any difference between sea glass and beach glass since both terms are popular to describe the medium. The answer is yes, mainly because of the difference in the chemical compositions (Ph levels) of salt water and fresh water. 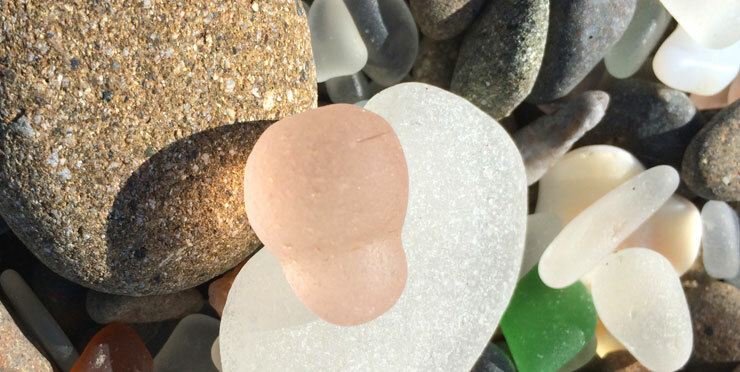 Sea glass that has been conditioned by ocean waters often has a more “frosted” appearance and pitting on the glass’ surface due to a chemical transformation called hydration. When glass is immersed in salt water for a long period, the soda and lime used in the glass making process leaches out and creates the familiar pitted and frosted surface of sea glass. Beach glass is created in fresh water, particularly the waters of the Great Lakes, and although it has been conditioned and smoothed by tumbling in waves, rocks and sand, its surface patina is different–less frosty and pitted than sea glass. That said, there is no difference in the value or beauty of sea glass vs. beach glass. Many people call sea glass “beach glass” and beach glass “sea glass.” Truly, the term is used interchangeably. So whether you’re looking for sea glass necklaces or beach glass necklaces you will find them here in our online sea glass jewelry boutique. We reference the origin of 90% of our sea glass jewelry designs and they all come from the oceans of the Atlantic, Pacific or Caribbean (so far, anyway). Read more about the origins of our sea glass in Where Does My Sea Glass Come From? Contact me with any questions. I always love to hear from sea glass lovers!